This fragile and intricate miniature gold relief consists of several sheets of gold that were chased and arranged by an unknown but extremely talented artist in the early seventeenth century. It depicts the biblical story of the Sacrifice of Isaac, and is associated with a slightly larger relief with the Crucifixion. Both of them appear to originate from the same precious object for private devotion. The amount of detail and ability of the maker to create a dynamic composition closely following the descriptions of the Bible are remarkable. The fragment has been mounted on a bespoke leather back and thus has become an independent work of art appreciated for its artistic and material value. This might have happened comparatively shortly after its creation and allowed close-up study. 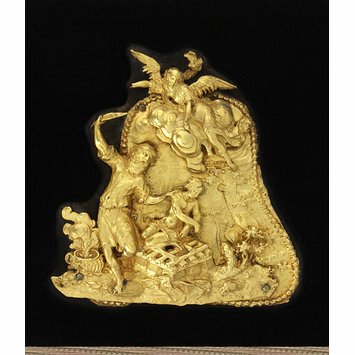 Several different types of nails used for securing the gold relief to the back and marks applied to the piece when it was imported to France in the late nineteenth century are testimony that this plaque remained a treasured masterpiece over centuries. Sir Arthur Gilbert (1913-2001) and his wife Rosalinde (1913-1995) formed one of the world's great decorative art collections, including silver, mosaics, enamelled portrait miniatures and gold boxes. The collection is on long-term loan to the Victoria and Albert Museum. 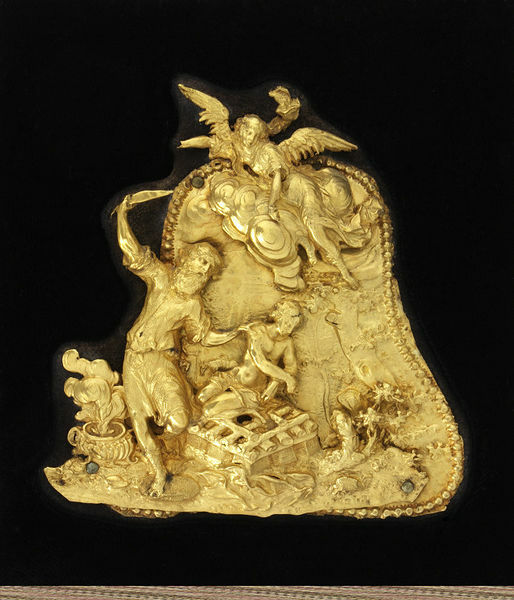 Gold plaque chased and embossed with a scene depicting the Sacrifice of Isaac. Provenance: S. J. Phillips, London. The crucifixion scene on the companion plaque of this piece is slightly larger than the Sacrifice of Isaac, and suggests that the Crucifixion once was the centre of a symmetrical composition of plaques on an object for private devotion. The Sacrifice of Isaac is described in the Book of Genesis in the Old Testament (Gen 22:2-13). In this story God commands the Patriarch Abraham to bind and sacrifice his own son, Isaac. At the very last moment, an angel intervenes and stops Abraham because his willingness to sacrifice his son is proof enough that he “fearest God” (Gen 2:12). Abraham sees a ram nearby, which is sacrificed instead. The subjects of this and its companion plaque, as well as their style are comparable to prints and larger works created not only, but especially for Protestant patrons, in the early seventeenth century. Already Martin Luther (1483-1546) considered the sacrifice of Isaac as prefiguration of cross and crucifixion, and as example of god testing faith as if he wanted to destroy the faithful (“als wölt er uns gar verderben”) when ultimately he answers their prayers. The composition of this plaque follows the story in Genesis and depicts its most dramatic moment: Abraham has raised his hand holding a knife to slaughter his son who is kneeling on the pyre with bound hands. The angel hovers above between clouds, his right arm (only the upper part of which survives) pointing towards Abraham’s knife, the left towards Isaac. The gestures symbolise the words exchanged between Abraham and the Angel: “Abraham! Abraham! And he said, Here I am. And he said, Lay not thy hand upono the lad, neither do thou anything unto him. For now I know that thou fearest God […]” (Gen 2:11-12). Even the ram is depicted with a shepherd in the background. Chapman, Martin. The Gilbert Collection of Gold and Silver. Recent Acquisitions 2. Los Angeles (Los Angeles County Museum of Art) 1991, cat. no. L.